Ok, I need the help of some Creative Suite wizard out there. I have an Illustrator File (.ai) created in an older version (don't know which one) that I very much need to open. I've downloaded the Illustrator CS demo to thus try an open it. 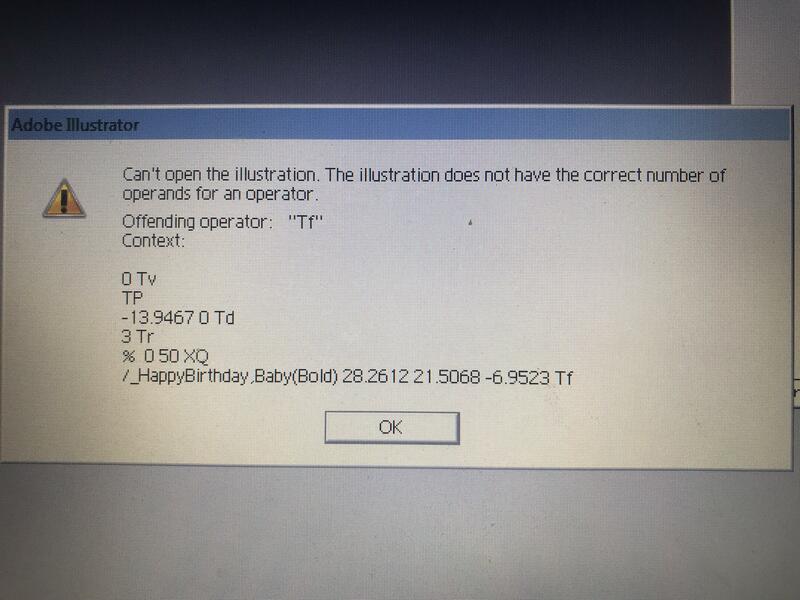 Can't open the Illustration. The Illustration contains an illegal operand. I suspect the file isn't totally messed up since I can open it in Photoshop CS and at least see everything, though then I don't have access to the text boxes within the document, which are the elements I'm interested in. you don't have access to your older version of illustrator? Possibly the file is corrupted. I used to get that all the time with vesion 7, if I saved over and on top of the same file over and over again, instead of save as. Try copying it and renaming it. Also maybe you can find that font its looking for, and make sure that font isn't corrupt. Sorry man if its corrupt. What I try to do when I'm switching versions is go back over my old work and seperate it without layers, then make all the text outlines, and save seperate eps's just in case. Unfortunately I don't have Illustrator 7 (or any other version) lying around. The file was made for us by a graphic artist. See, this is why we're now trying to do everything in-house. Actually, could be not having the required font be a problem? One of the reasons we want to open the file is to find out the name of the font, which I know I don't have. When I try to open other files that I think use this same missing font it just substitutes in a replacement. Hi, I’m having the issue with offending operator Tf. The file opens but only part of what I created shows up. I’m hoping I won’t have to redo everything I’ve done. Is there a way to open the file with any substitute fonts? I’m not worried about the font. My worried about losing the vectors. Can this be done? Can someone help me?